Figure 3-10. Level turn to the left. The ailerons bank the wings and so determine the rate of turn for a given airspeed. Lift is divided into both vertical and horizontal lift components as a result of the bank. The horizontal component of lift moves the airplane toward the banked direction. The elevator pitches the nose of the airplane up or down in relation to the pilot and perpendicular to the wings. If the pilot does not add power, and there is sufficient airspeed margin, the pilot must slightly increase the pitch to increase wing lift enough to replace the wing lift being diverted into turning force so as to maintain the current altitude. The vertical fin on an airplane does not produce lift. Rather the vertical fin on an airplane is a stabilizing surface and produces no lift if the airplane is flying straight ahead. The vertical fin’s purpose is to keep the aft end of the airplane behind the front end. The throttle provides thrust which may be used for airspeed to tighten the turn. The pilot uses the rudder to offset any adverse yaw developed by wing’s differential lift and the engine/ propeller. The rudder does not turn the airplane. The rudder is used to maintain coordinated flight. For purposes of this discussion, turns are divided into three classes: shallow, medium, and steep. Shallow turns—bank angle is approximately 20° or less. 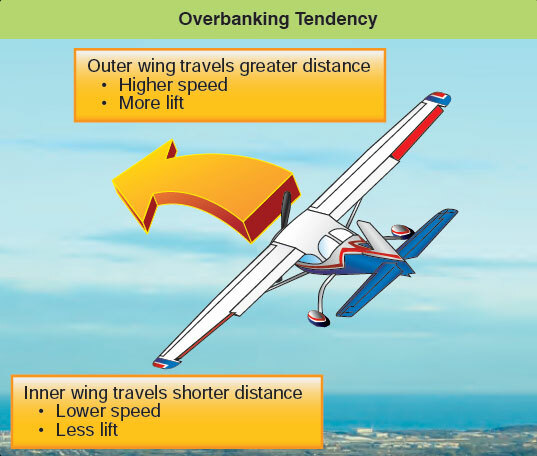 This shallow bank is such that the inherent lateral stability of the airplane slowly levels the wings unless aileron pressure in the desired direction of bank is held by the pilot to maintain the bank angle. Medium turns—result from a degree of bank between approximately 20° to 45°. At medium bank angles, the airplane’s inherent lateral stability does not return the wings to level flight. As a result, the airplane tends to remain at a constant bank angle without any flight control pressure held by the pilot. The pilot neutralizes the aileron flight control pressure to maintain the bank. Steep turns—result from a degree of bank of approximately 45° or more. The airplane continues in the direction of the bank even with neutral flight controls unless the pilot provides opposite flight control aileron pressure to prevent the airplane from overbanking. The amount of opposite flight control pressures is dependent on various factors, such as bank angle and airspeed. In general, a noticeable level of opposite aileron flight control pressure is required by the pilot to prevent overbanking. When an airplane is flying straight and level, the total lift is acting perpendicular to the wings and to the Earth. As the airplane is banked into a turn, total lift is the resultant of two components: vertical and horizontal. [Figure 3-11] The vertical lift component continues to act perpendicular to the Earth and opposes gravity. The horizontal lift component acts parallel to the Earth’s surface opposing centrifugal force. These two lift components act at right angles to each other, causing the resultant total lifting force to act perpendicular to the banked wing of the airplane. It is the horizontal lift component that begins to turn the airplane and not the rudder. In constant altitude, constant airspeed turns, it is necessary to increase the AOA of the wing when rolling into the turn by increasing back pressure on the elevator, as well as the addition of power to counter the loss of speed due to increased drag. This is required because total lift has divided into vertical and horizontal components of lift. In order to maintain altitude, the total lift (since total lift acts perpendicular to the wing) must be increased to meet the vertical component of lift requirements (to balance weight and load factor) for level flight. The purpose of the rudder in a turn is to coordinate the turn. As lift increases, so does drag. When the pilot deflects the ailerons to bank the airplane, both lift and drag are increased on the rising wing and, simultaneously, lift and drag are decreased on the lowering wing. [Figure 3-12] This increased drag on the rising wing and decreased drag on the lowering wing results in the airplane yawing opposite to the direction of turn. To counteract this adverse yaw, rudder pressure is applied simultaneously with aileron in the desired direction of turn. This action is required to produce a coordinated turn. Coordinated flight is important to maintaining control of the airplane. Situations can develop when a pilot is flying in uncoordinated flight and depending on the flight control deflections, may support pro-spin flight control inputs. This is especially hazardous when operating at low altitudes, such as when operating in the airport traffic pattern. Pilots must learn to fly with coordinated control inputs to prevent unintentional loss of control when maneuvering in certain situations. Figure 3-12. 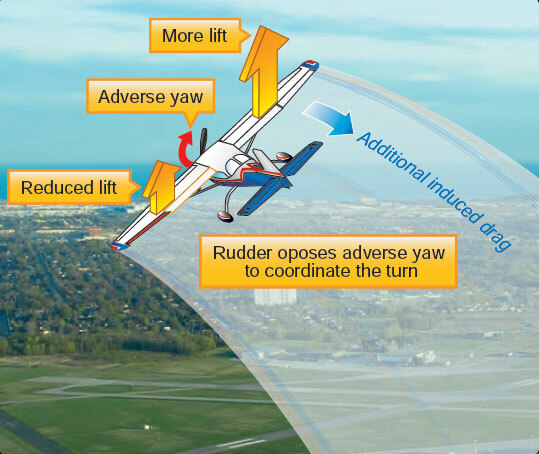 The rudder opposes adverse yaw to help coordinate the turn. During uncoordinated flight, the pilot may feel that they are being pushed sideways toward the outside or inside of the turn. 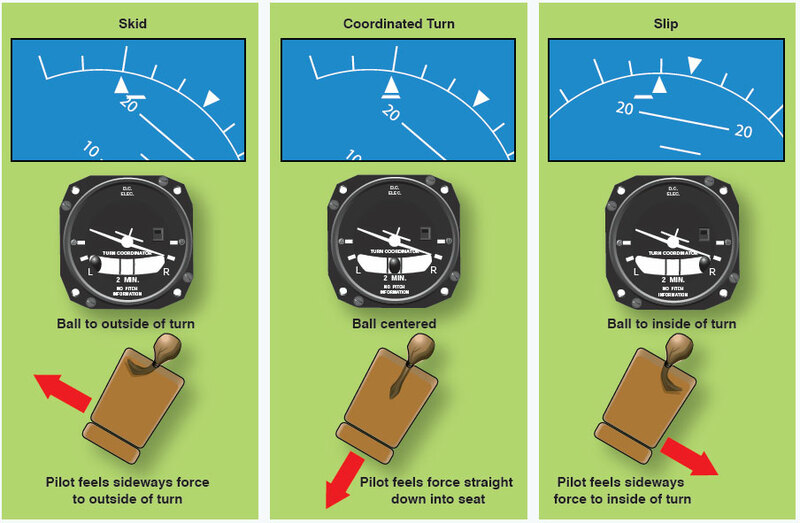 [Figure 3-13] A skid is when the pilot may feel that they are being pressed toward the outside of the turn and toward the inside of the turn during a slip. 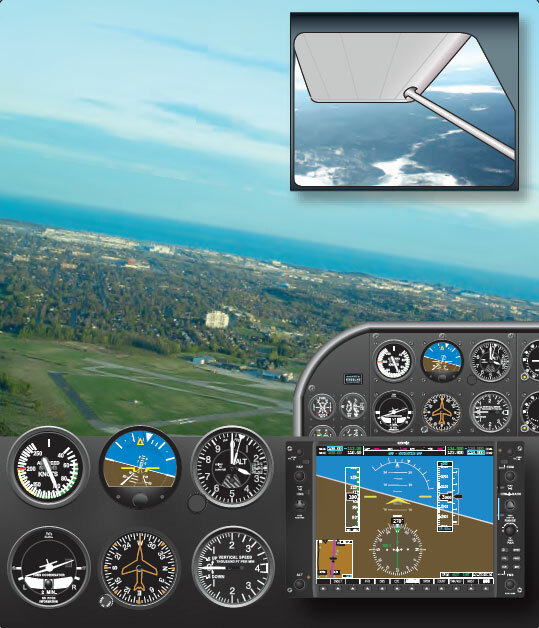 The ability to sense a skid or slip is developed over time and as the “feel” of flying develops, a pilot should become highly sensitive to a slip or skid without undue reliance on the flight instruments. To understand the relationship between airspeed, bank, and radius of turn, it should be noted that the rate of turn at any given true airspeed depends on the horizontal lift component. The horizontal lift component varies in proportion to the amount of bank. Therefore, the rate of turn at a given airspeed increases as the angle of bank is increased. On the other hand, when a turn is made at a higher airspeed at a given bank angle, the inertia is greater and the horizontal lift component required for the turn is greater, causing the turning rate to become slower. [Figure 3-14] Therefore, at a given angle of bank, a higher airspeed makes the radius of turn larger because the airplane turns at a slower rate. As the radius of the turn becomes smaller, a significant difference develops between the airspeed of the inside wing and the airspeed of the outside wing. The wing on the outside of the turn travels a longer path than the inside wing, yet both complete their respective paths in the same unit of time. Therefore, the outside wing travels at a faster airspeed than the inside wing and, as a result, it develops more lift. This creates an overbanking tendency that must be controlled by the use of opposite aileron when the desired bank angle is reached. [Figure 3-15] Because the outboard wing is developing more lift, it also produces more drag. The drag causes a slight slip during steep turns that must be corrected by use of the rudder.